A Manchez in GTA Liberty City Stories. 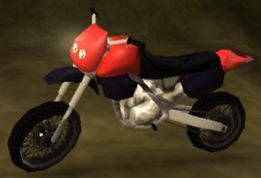 The Manchez is a dirtbike in Grand Theft Auto: Liberty City Stories. Based on its rhyming name, the Manchez is implied to be an improved variant of the Sanchez, giving the player much more stability, durability, speed, and maneuverability. The Manchez is one of the best vehicles in GTA Liberty City Stories, having the handling, speed, agility and size required for all stunt jumps. It has extreme off-road capabilities, and has a good acceleration. It resembles a 500cc KTM with a round lighthead, and is only available in a black and red paintjob. The Manchez only available after completing the ten courses of "Bumps and Grinds", when it is unlocked and is spawned at the dirt track in Harwood, Portland, the same location where the Sanchez that activates the "Bumps and Grinds" side-mission is located. By commandeering the Manchez, the player will reactivate the "Bumps and Grinds" side-mission, so players must deliberately fail the side-mission in order to ride it away or push it off the track. "Manchez" is a play on the word "mancha", Spanish for stain. This page was last modified on 6 August 2012, at 22:41.